NEW YORK (CNNMoney) -- Facebook has agreed to buy photo sharing network Instagram for $1 billion in a combination of cash and stock, the company announced Monday. It's Facebook's biggest acquisition ever, in both price and reach. With around 30 million active users, Instagram has the largest audience of any startup Facebook has purchased, Facebook CEO Mark Zuckerberg said in a blog post. "We don't plan on doing many more of these, if any at all," Zuckerberg wrote. "But providing the best photo sharing experience is one reason why so many people love Facebook and we knew it would be worth bringing these two companies together." Founded in 2010 by Mike Krieger and Kevin Systrom, Instagram has just a handful of employees supporting its wildly popular photo app, which lets users add distinctive filters and visual flair to photos they've snapped on their smartphones. The long-awaited Android version, released last week, racked up more than 1 million downloads in just 12 hours. The launch also met a backlash from iPhone users, who enjoyed having an exclusive hold on the stylish service. Just one month ago, Instagram's creators claimed they had no interest in selling. "We're pretty focused on remaining an independent company right now," Instagram cofounder Systrom told CNNMoney at South by Southwest, where the company delivered a talk on its wild growth. 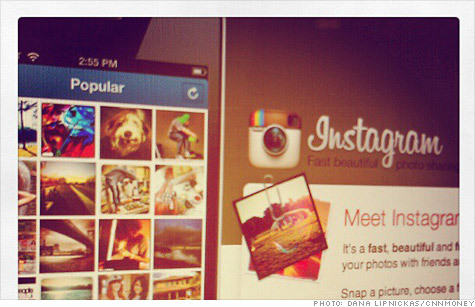 Even some of Instagram's investors were startled by the takeover. Late last week, Instagram closed a $50 million financing round that valued the company at $500 million, according to a source involved in the deal. Those investors essentially doubled their money, instantly. Facebook likes to scoop up hot startups, kill their products, and redeploy their staff on other projects. That's definitely not the plan for Instagram, all the players insist. "It's important to be clear that Instagram is not going away," Instagram's founders wrote on their company blog. "We'll continue to add new features to the product and find new ways to create a better mobile photos experience." "We're committed to building and growing Instagram independently," the CEO said. "Millions of people around the world love the Instagram app and the brand associated with it, and our goal is to help spread this app and brand to even more people." Facebook, which is in the process of going public, ended 2011 with a cash stash just shy of $4 billion. It's paying steep price for a startup that has lots of buzz but no business model. Here's a fun comparison: Yahoo (YHOO, Fortune 500) paid just $35 million seven years ago for Flickr, which remains one of the Web's most popular photo networks. Instagram is a free app and doesn't charge for any of its services. The company's founders insisted that would come in time, once they'd built a sizeable user base. Instagram was their second stab at a product. Before "pivoting" to create the wildly popular photo sharing app, the crew was working on a check-in service called Burbn. "I remember what I'll call 'pivot day.' We sat down and said 'what are we going to work on next? How are we going to evolve this product into something millions of people will want to use?'" Systrom said last year. "What is the one thing that makes this product unique and interesting?" The answer they hit on was "photo sharing," and the result was Instagram.